I'm in a handful of Survivor Pools each year, some for big money and some simply for bragging rights among friends. I've been doing this dedicatedly for more than a decade. Not sure I can remember a season like this one - most of my competitions are finished already. It seems like every week there's at least one double-digit favorite losing. Week 6 was no exception. I would have bet almost anything that Denver would have handled the visiting Giants last Sunday night. Not so much because the Broncos are all that good, but they were off a bye and New York was missing about half its team due to injury, including every receiver you have heard of. So, of course, New York won 23-10. Orleans Darkwa rushed for 117 yards on the NFL's best run defense?!?!?!? Orleans Darkwa sounds like some lower-level Star Wars Jedi. And, yeah, go ahead and pick him up this week, but he's not your fantasy FB savior. The Falcons - the team that killed me in Week 4 vs. Buffalo -- were coming off their bye week and led the Miami Cutlers 17-0 at halftime last Sunday. Considering the Fins hadn't scored even 20 points all season, that game was over. Except it wasn't: Cutlers 20, Falcons 17. Meanwhile, no rookie quarterback had ever won at Baltimore against a team coached by John Harbaugh, so of course Mitchell Trubisky led my Bears to a 27-24 overtime upset. I could go on and on. It was truly an underdog's paradise of a weekend. That tends to happen when there are a lot of non-offensive scores. In Week 6, there were a total of 15 of them (defensive or special teams). That was second-highest total of non-rushing/passing touchdowns scored in a single week since 1970 (16 in Week 15, 1998). The Lions-Saints shootout was a non-offensive TD extravaganza … and of course I was going up against the Detroit defense/special teams (two fourth-quarter TDs) in my main fantasy league in Week 6 and ended up losing by less than two points. Ridiculous! Off in Week 7 are Detroit and Houston - you don't have to be a Beautiful Mind to understand that two teams on the bye are the fewest possible. Here are the picks, with the chosen team listed first. It's an unusual week with no clear-cut uber-favorite. 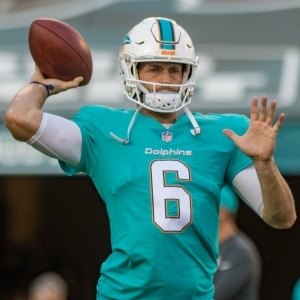 Miami vs. NY Jets: This hurts me more than you can know, picking Cutler as my Survivor Pool selection of the week. I assure you that this has little to do with him, but that Jay Ajayi broke out of his slump last week and the Miami defense is good. The Fins did lose 20-6 at the Jets in Week 2, but I expect a flipped score this time around. Minnesota vs. Baltimore: Joe Flacco is simply not a good quarterback any longer. Do you realize he has topped 230 yards once all season and has thrown TDs in only three games and picks in five? The Ravens need to start thinking long-term QB replacement in the 2018 draft. The Vikings might win the NFC North now thanks to a certain injury in Green Bay. Dallas at San Francisco: The 49ers are very competitive this year despite being winless, the first team ever to lose five straight games by three points or fewer. That said, I might move the Cowboys, off their bye, to the top spot now that Ezekiel Elliott apparently is playing. One day, he's suspended. The next, he's not. People wonder why our courts are backlogged. Seattle at NY Giants: Perhaps the only thing the Giants needed all along was Ben McAdoo, who looks like Andy Reid's long-lost son, giving up offensive play-calling. New York figures to stay run-heavy the rest of the season. The Seahawks should win, though, coming off their bye and the fact this is a 4:25 p.m. ET start instead of 10 a.m. Pacific. New England vs. Atlanta: Arguably the most anticipated game of the season and a Super Bowl rematch has lost some luster because all of a sudden the Patriots stink on defense (No. 1 in 2016) and the Falcons do on offense (No. 1 in 2016). Philadelphia vs. Washington (Monday): How about an Eagles-Chiefs Super Bowl? Sure, I saw that coming. Carson Wentz could be the NFL's best quarterback as soon as next season. Carolina at Chicago: Bears likely will need more than eight Trubisky completions to win this game. Panthers off extra rest (played last Thursday), and that should be enough for a close road victory. Oakland vs. Kansas City (Thursday): The Raiders look nothing like last year's team, and I'm only picking them here because a loss essentially ends their playoff hopes. Buffalo vs. Tampa Bay: Maybe I was sucked in by "Hard Knocks" or because I lived in Tampa for a while, but I thought the Bucs were dark-horse NFC contenders this year. I don't like them here with the Bills off their bye and Jameis Winston no sure thing to play with a shoulder injury. Tennessee at Cleveland: This might be the Browns' best chance at a win until Week 15 vs. Baltimore. Not that Tennessee is lousy, but it's a short week, Marcus Mariota still might not be 100 percent from his hamstring injury and the Titans could be peeking ahead to their Week 8 bye. New Orleans at Green Bay: Aaron Rodgers' broken collarbone ends the Packers' Super Bowl (and possibly playoff) hopes. As a Bears fan, I'm legally required to hate Green Bay, but you never want to see a player of that quality get hurt. The NFL is worse off without Rodgers. Jacksonville at Indianapolis: I need to learn to stop picking the Jags in home games; they have been a totally different squad away from home (including London). I would stay away, though, if Leonard Fournette is out. Pittsburgh vs. Cincinnati: Trap game for the Steelers off their upset of the previously unbeaten Chiefs and with the Bengals off their bye? Wouldn't shock me. Random, useless stat: the Bengals will wear white jerseys and black pants. They're 25-28 in that combination since 2004. LA Chargers vs. Denver: Have the Chargers learned to win close games instead of gagging them away late? They have the past two weeks at the Giants and at the Raiders. Now if they could only get some fan support in their home soccer stadium. LA Rams vs. Arizona: This game is on London, the first this year at Twickenham Stadium and first with a 1 p.m. ET kickoff instead of 9:30 a.m. ET. That stinks as the only way I'd care about this game is if it was on by itself. It's always hard to judge these London games because you don't know how teams will react to the time change and bad British dentistry, etc.